It has been a very long week with little time to paint. I'm looking forward to some paint time this weekend. This little 5x7 painting is one of few efforts I was able to squeeze in. It was created using a limited palette in order to practice values. The sky is usually the lightest section in a landscape and the trees the darkest. With a limited palette of blue, red, yellow and white, the biggest challenge was mixing a dark that could represent believable trees. 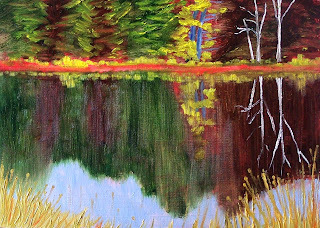 Ultramarine Blue and Perylene Red resulted in a dark purple that was acceptable for the trees and their reflections in the water. 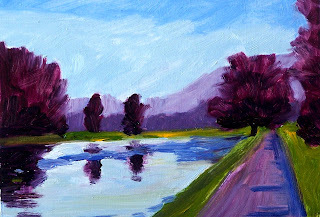 The result of my efforts was a useful practice with values and an attractive little purple landscape. I am going to continue to explore values and mixtures with a limited palette. I'm longing to purchase a tube of Chromatic Black, which I've heard is quite different than any other black. It is rumored to have transparency and mixing qualities like no other black, but that's a story for a future, yet unpainted effort. 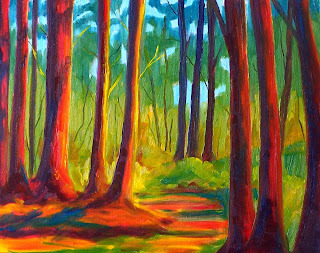 This painting has been sold, but you can find some of my other small landscape paintings here. 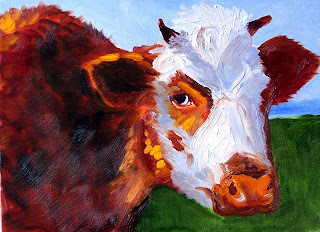 I didn't want yesterday's cow to get lonely, so I've posted another cow portrait from my growing collection of cow paintings. This cow looks a little upset, like she's giving me the evil eye. She is painted on a 9x12 inch stretched canvas. You can view some closeups of the heavy impasto at my Etsy Gallery. The paint is quite thick and adds texture that suggests her thick hair. Please contact me at smallimpressions@hotmail.com if you are interested in purchasing this painting. This week when I checked out the Different Strokes Challenge photo, I was thrilled to see that the subject would be a cow. I love to paint cow portraits! While not the largest cow portrait I've ever painted, it does edge out my 5x7 inch Mad Cows , Cow Girls, and Curious Cow paintings. This one is an 8x10 oil painting. She was fun to paint, but looks a little grumpy, thus I've named her the Grumpy Cow. 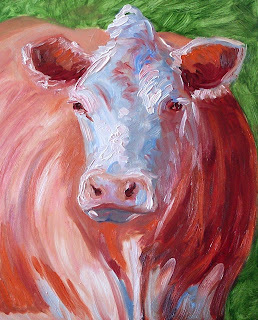 She has already SOLD, but I will be adding new cow paintings to the Etsy Gallery from time to time as well as other animal paintings, so check in often. 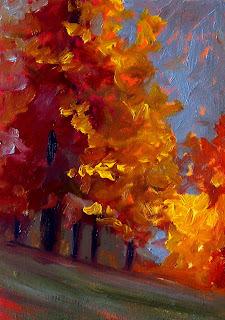 Working with a limited palette, I created this little 5x7 autumn oil painting today. After reading through some of Bob Rohm's new book, The Painterly Approach, I used a limited palette consisting of Cadmium Yellow, Perylene Red, Ultramarine Blue, and White. He offers a useful definition that expresses the difference between the "linear" approach and the "painterly" approach. 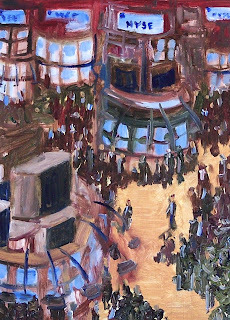 My work clearly falls into the painterly approach as he defines it. He suggests a number of different palettes and provides beautiful examples of paintings using each. I am anxious to purchase a few new paints as a result. This book is a wonderful review of painting landscapes in oil with some new ideas thrown in. It updates some of the ideas in Carlson's Guide to Landscape Painting and presents them in a colorful, contemporary manner. 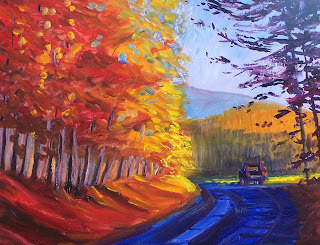 It provides plenty of inspiration, reviews color theory, and presents a painterly approach to painting landscapes. Please contact me at smallimpressions@hotmail.com with the date of this blog entry if you are interested in purchasing this painting. This evening I am busy preparing to enter a county art purchase competition. Choosing five paintings that are at least three square feet, but not more than twelve square feet has kept me busy weighing the options and doing basic math. I usually think of my work on a square inch basis, so had to do some basic math to make sure my choices were large enough to qualify. It was easy to recognize that I didn't have to worry about going over 12 square feet. Although I would love to try painting something that large, the physical space in my studio barely accomodates my 24x30 inch paintings. This 18x24 inch painting barely qualifies if I've done my math correctly. It is based on a path that meaders off Wahop Lake Road at Fort Steilacoom Park south of Tacoma in Pierce County, Washington. The park is full of trails and a great place for walking and biking. Please contact me at smallimpressions@hotmail.com with the date of the blog entry if you are interested in purchasing this painting. As happens from time to time, if I don't like a painting, I scrape it off. The surface is usually left with odd textures and an unexpected neutral tone. I never think of these scape offs as disasters because eventually I come back to the altered surface and paint something else. Surprisingly, these recycled boards usually give me a freedom that doesn't manifest with an untouched surface. It is like magic that art emerges from the scaped-off surface and something new looks back at me. That is the story of this little grove of autumn trees. Quick and fun to paint, I felt a wonderful sense of satisfaction. The painting is a 5x7 inch oil painting on a recycled hardboard panel. It recently SOLD, but there I have many other small landscape paintings available at Small Impressions Gallery. Today's little 5x7 inch oil painting resulted from my quest to paint the perfect tree. 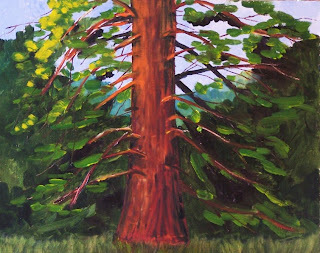 While I love to paint trees, they always present challenges. A painter of trees needs to consider the directions from which the light approaches--which side of the tree will be dark and which side will be lighter. What positions will the trunk and the branches take? How dense is the foliage? Where do the shadows fall? What colors should be selected for the shadows and what colors should be selected for the lighted areas? Where should the sky holes fall in the foliage of the trees? At what point does the background show through? Where does the light hit the branches and the trunk and how does that look? And how can I reproduce it with paint and a brush? Small sized works such as this one are great for practicing. Perhaps I'll never paint the perfect tree, but I sure do have fun trying. A tough week in the financial markets. This 5x7 inch oil painting was inspired by Karin Jurick's Different Strokes Challenge and documents a historic period in modern American history. Painting this representation presented quite a challenge for me. First it reminded me of tough times, but then it reminded me that this too shall pass. Better days are on the horizon and I'm looking forward. Can't decide whether to sell this one or keep it as a good luck token. Last weekend I took a road trip to the Pacific Coast. It was lovely to see the autumn colors beginning to take over the landscape. I left in the evening and was able to watch the sun set and broadcast a golden glow on the foliage as I passed. This 8x10 inch oil painting was inspired by this experience. When the paint dries, I will place this painting in my Etsy Gallery. 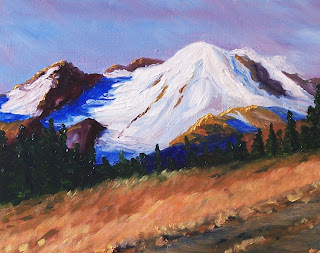 Today's 8x10 painting is representative of Mount Rainier in Washington State. It is an icon of the Pacific Northwest and a delightful place to visit. I've written about it often and enjoy visiting whenever I can. My last article concerning Mount Rainier was about bicycling on the mountain and the amazing atheletes who practice their skill pedaling up hill. You can read more about the exploits of Pedaling to Paradise here. Please contact me at smallimpressions@hotmail.com with the date of the blog entry if you are interested in purchasing this painting. Other small oil painting can be purchased from my Etsy Gallery. Please stop by for a visit. 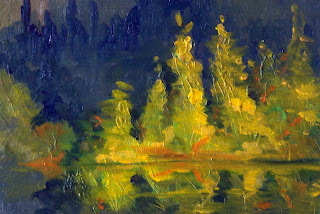 Today's miniature 5x7 inch oil painting was inspired by a reflection on Lake Cushman in Western Washington State. Originally on the North Fork of the Skokomish River, it was expanded considerably in 1926 with the construction of Cushman Dam No. 1 which provided electrical power to the City of Tacoma. The lake is part of the Olympic National Forest which provides an abundance of recreational activities. Today's painting is available for purchase in my Etsy Gallery for $50.00 plus $6.50 for shipping to US addresses. Other miniature Washington landscape paintings are also available in the gallery. As the colors of fall begin to show themselves, nature gives us a delightful light show. 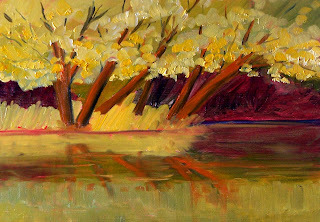 This 5x7 inch oil painting was inspired by the color of low-hanging trees at Waughop Lake. The lake is located in Fort Steilacoom Park in Pierce County, Washington. It is one of my favorite places to ride my bike. I prefer to ride on the paved roads of the park, but it also offers trails for those who like to ride mountain bikes. There is an off-leash dog park within the larger park, soccer fields, baseball fields, a large children's playground, and plenty of area for walking and enjoying the outdoors. This painting is available for purchase in my Etsy Gallery for $50.00 plus $6.50 for shipping to US addresses. Othere miniature landscape paintings can be seen in the landscape section of the gallery. 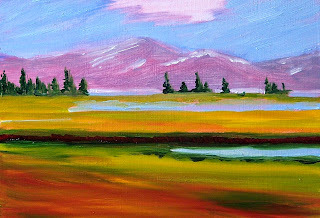 Today's 5x7 inch oil painting is another of my Montana inspired paintings. 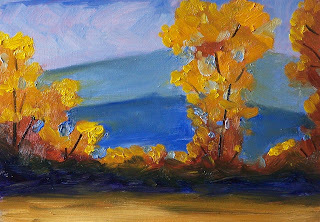 A trip to Yellowstone National Park a few years ago has kept me painting and longing to return. The lakes, rivers, and mountains provide beautiful landscape and endless recreational activity. This painting, created on a 1/4 inch hardboard panel is for sale in my Etsy Gallery along with many other miniature landscape oil paintings. 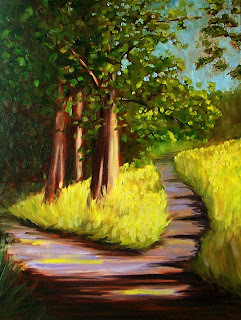 A photo reference of a path in the Redwood Forest of Northern California is the inspiration for this 8x10 inch oil painting. The reference is from the Wetcanvas Reference Image Library, a public domain collection of photos available for artistic reference. I have visited the Redwoods numerous times, but mostly passing through on route to more southern cities. Because of my love of hiking and exploring natural habitats, I want to visit again very soon. In retrospect, I wish I had placed a few people in the painting; it is only through a comparison to man that one can appreciate the amazing size of these ancient trees. 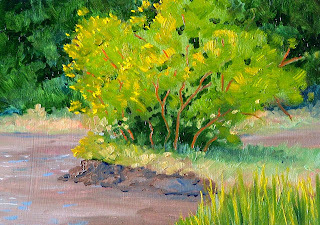 Today's miniature 5x7 inch oil painting resulted from a trip to the Nisqually River Delta in Western Washington State, home of the National Wildlife Refuge. In the 1800's and early 1900's, more than half of the natural salt marsh of the area was destroyed by the building of dikes to create farm and pasture land. The natural marshes were diminished. This little painting celebrates the return of the salt marsh and the estuary it supports. An article published today at TheNewsTribune.com explains the details of the Nisqually Delta Restoration Project. I am excited about the changes and look forward to seeing the salt marshes and the wildlife it attracts expand to their natural state once again. This painting can be purchased at Etsy for $50.00 plus $6.50 for shipping to US addresses. Other miniature oil paintings are available in my Gallery at Etsy. Multnomah Falls is located in the Columbia Gorge on the Northern border of Oregon State. 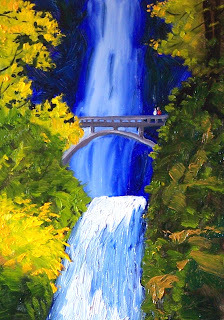 The gorge is home to numerous falls, but Multnomah Falls are particularly spectacular. It is the second highest year-round waterfall in the United States. The Benson Bridge, pictured in this 5x7 inch oil painting, was erected in 1914. Visiting the Columbia Gorge Scenic area is definitely worth your time with more than 80 miles of lovely Pacific Northwest beauty and numerous opportunities for recreation. Closeups of the brushwork on this painting are available in my Etsy Gallery. This painting is available for purchase for $50.00 plus $6.50 for shipping to US addresses. This little 5x7 inch oil painting was so much fun to paint. It is the result of the Different Strokes Weekly Challenge. Every Wednesday Karin Jurick posts a photo for artists to use as a reference for painting. They are then invited to send her their artistic version for posting on her Different Strokes Blog. 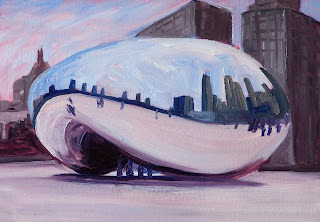 This week the Cloud Gate Sculpture located in the Millennium Park in Chicago was our subject. Not only was it fun to paint, but it has inspired me to save up for another trip to Chicago. I haven't been there for a long time, but I recall there is so much to see in Chicago. It would be wonderful to visit again. You can read more about the Different Strokes Blog at Charley Parker's Blog, Lines and Colors. Autumn is definitely here. Yesterday there was a wind storm that downed trees, limbs, and leaves. This morning I was able to sneak out and take a bike ride between rain showers. 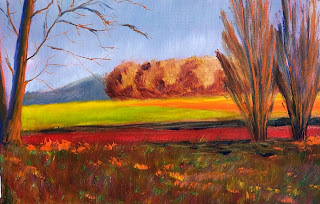 Color is on the trees and in the fields. 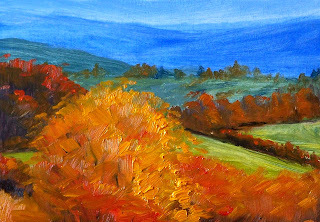 Today's painting is a 5x7 inch oil painting inspired by the colors of fall. 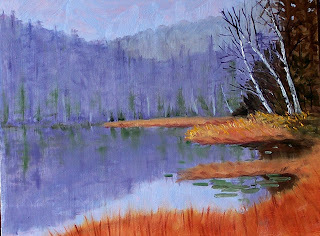 The distant trees were painted with a couple of my favorite colors--Gamblin's Transparent Earth Red and Transparent Earth Orange. The red is especially rich. Closeups and purchase information are available in my Etsy Gallery. Today I spent some time working on recycled boards. My recycled boards are paintings that I don't like and toss into a basket--not wanting to share the results with anyone, but not having the ethic to just throw them away. Later, I pull out the ugly painting and create something new over the top. It is fun because I never worry about the results. My brush strokes are loose and creative. The boards provide interesting color combinations and textures that don't exist on a new board. This painting is one of several that resulted from a recycled board. It is 5x7 inches and has wonderful textures and contrast. When it is dry, I will sell it in my Etsy Gallery. This afternoon I've been thinking about what makes people want to collect art. There are numerous opinions on this question, but just about every article read or opinion heard contains the idea that collectors should choose artwork that moves them, not artwork that decorates the room. Decorating the room is fine, but if that is your impetus for buying art, it is likely you will soon tire of it and wish for something different. Instead, buy art that has an emotional connection for you. The emotional connection will likely be something very personal and may not match your room at all. It will engage your heart every time you enter the room. It will last a life time, and it will become an heirloom to pass on to those you love. Today's painting is available for purchase at Northwest Fine Woodworking in Seattle's Pioneer Square. This morning was the first foggy day of the fall season. When October rolls around, thick blankets of fog are certain in the Pacific Northwest. Today's painting offers an example of the damp air that accompanies the season. It was inspired by the fog on Alder Lake in Washington State. Alder Lake was created in 1945 with the building of the Alder Lake Dam. It has since become a year round recreation destination. Hearty campers can camp at any one of the four campgrounds at the lake. They are open year around with the exception of about two weeks in late December. Boating, fishing, and hiking are activities that keep visitors busy in the fall season. Closeups of the brush strokes on this painting can be seen at my Etsy Gallery. The painting can be purchased for $125.00 plus $12.00 for shipping to US addresses. Just click on this purchase link.